The main feature of existing delegation authorization models focuses on whether the delegatee could execute the delegated privileges, and delegator’s platform would be trusted or not. The paper proposed a delegation authorization security protocol based on remote attestation in multimedia social networks environment. Multimedia contents’ trusted delegation authorization can be guaranteed in the protocol. This protocol not only ensures delegator and the multimedia server trust in delegatee’s authentication and platform integrity, but also achieves the trusted access to the multimedia. Delegation verification, message interactions between entities are presented. 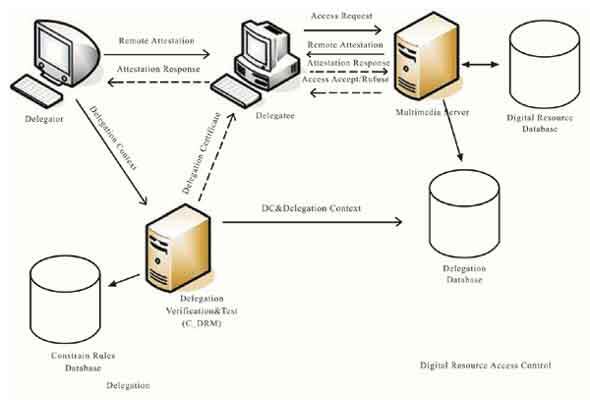 The potential attacks are enumerated and analyzed, and the delegation authorization protocol based on remote attestation applied in Digital Rights Management implementing the trusted delegation and usage control functions compared by the other protocols available. Delegation, digital rights management, remote attestation, security protocol, trusted computing. Department of Wuhan University of Technology, China.